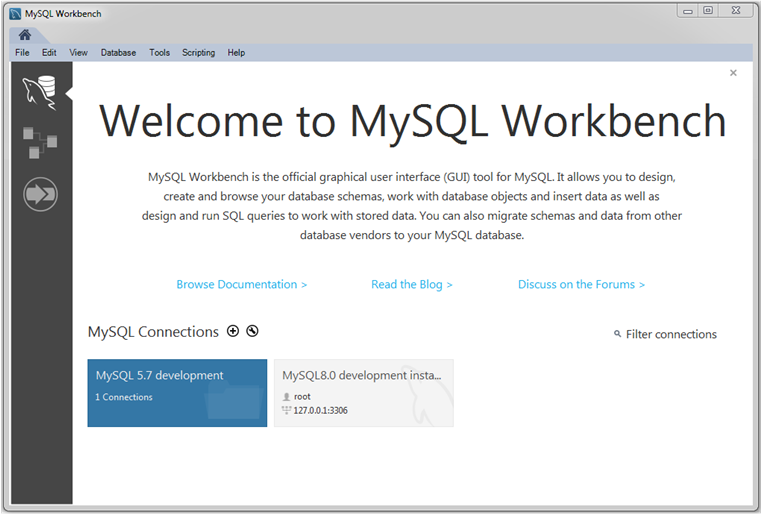 When started, MySQL Workbench opens to the home screen tab. Initially, the screen displays a welcome message and links to Browse Documentation >, Read the Blog >, and Discuss on the Forums >. In addition, the home screen provides quick access to MySQL connections, models, and the MySQL Workbench Migration Wizard. As depicted in the following figure, a home-screen side panel enables you to toggle between MySQL Connections (selected in the figure) and Models within the home tab. The last option in the side panel opens the MySQL Workbench Migration Wizard in a new tab. In MySQL Workbench 6.3.8 and earlier, the home screen combined three sections titled MySQL Connections, Models, and external Shortcuts. Workbench Welcome Message. The welcome text and links are optional and can be removed or restored to the home screen when MySQL Connections is selected from the side panel. Links to the documentation, blog, and forums are also accessible from the Help menu. To remove the text and links, click the X icon above the welcome message. Click Edit, Preferences, and then select Other. Select the Show Welcome Message on Connections Screen check box and then restart MySQL Workbench. The connections view ( ) in the side panel, when selected, displays a list of established connections to local and remote instances of MySQL. It enables you to load, configure, group, and view information about each MySQL connection. For more information, see Chapter 5, Connections in MySQL Workbench and Section 5.2, “Creating A New MySQL Connection (Tutorial)”. Connection Groups. You may also create groups of connections. Create a group by either right-clicking a connection and choosing the Move to group context menu option, or you may prefix your connection name with the group name separated by a forward slash (for example, "QA/TestBox") when you create or configure the connection. Connection Information. Click Manage Connections from the Database menu (or Edit Connection from the context menu of each connection) to view connection details. Plus-sign button (+) adds a new model. Folder button (see the figure that follows) enables you to browse for and open saved models. More button (>) opens a context menu with additional commands, such as Create EER Model from Database. For additional information about modeling, see Chapter 9, Database Design and Modeling. The migration view ( ) in the side panel, when selected, opens the Migration tab and displays an overview of prerequisites for using the wizard. From the Migration tab, you can start a migration process, open the ODBC administrator, or view documentation. For detailed instructions on using the wizard, see Chapter 10, Database Migration Wizard.